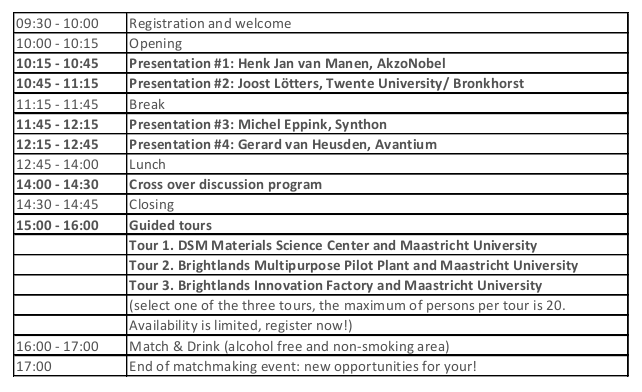 This matchmaking event will take place at Brightlands Chemelot Campus Geleen. During this event we want to provide insight into the recent technological developments in the field of Chemistry and the Brightlands Chemelot R&D campus. In addition, the goal is to inform the visitors about the recent public-private cooperation programs. During a closing drink there is also an opportunity for networking. The program includes four presentations, a cross-over discussion program and guided tours through Brightlands Chemelot Campus. Brightlands Chemelot Campus is a world-leading innovation location in smart materials and sustainable manufacturing and home to a vibrant and fast-growing open community of groundbreaking companies and knowledge institutes. For more information go to the website of Brightlands Chemelot Campus. If you want to travel by car, it’s possible to select a parking ticket in the registration. Please go to Gate 2. For public transport it’s possible to take a bus from the station, which departs every half hour to Chemelot Campus Urmond. Participation to this event is free of charge. Click here for registration to this matchmaking event.